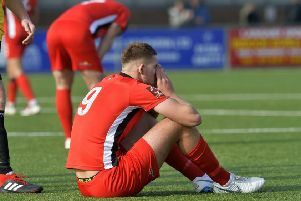 Borough were beaten 2-0 at newly crowned champions Torquay United last Saturday and it leaves them just one point above the National League South relegation zone. Borough played with spirit in Devon in front of a large crowd of 4,538. However, Connor Lemonheigh-Evans opened the scoring for the hosts, nodding home the rebound after his 23rd minute penalty was saved, before Jake Andrews fired into the roof of the Eastbourne net with just seven minutes to play to secure United’s promotion back to the National League at the first attempt. This Saturday Borough will desperately search for their first win since January 5 as they welcome eighth placed Dartford to Priory Lane. Mark McGhee’s men have 38 points from 39 matches. Hungerford Town are third from bottom and occupy the final relegation place on 37 points, with fourth bottom Truro, who have a crucial game in hand, also on 37 points. East Thurrock on 33 points are second from bottom with Weston Super-Mare botttom on 31. Nervous times for all involved at Priory Lane.